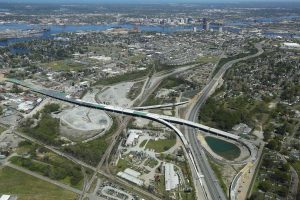 The Virginia Department of Transportation (VDOT) entered into a $2.1 billion comprehensive agreement with developer Elizabeth River Crossings (ERC) to complete this large-scale design-build project. DAVENPORT served as a sub-consultant to lead designer Parsons Brinckerhoff (PB). The overall scope of this six-year undertaking included doubling the capacity of the Midtown Tunnel, and rehabilitating the existing tunnels, thus improving safety and functionality. DAVENPORT’s role included the development of ALL traffic signs (overhead and ground mounted), and pavement markings for this project. 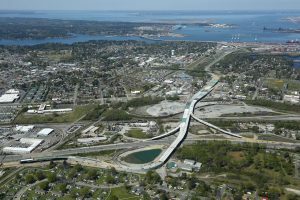 DAVENPORT’s competency of MUTCD and VDOT standards were important and aided in the proficiency of this project. One of the goals of this rehabilitation was to make way-finding in the complex tunnel structure clearer and more informative. DAVENPORT used Transoft Solutions GuideSign to design and produce signs. DAVENPORT also provided signing and pavement markings for the toll component of this project. As Virginia’s first full-scale, all electronic toll collection facility, signing and pavement marking were critical to the success of this project.